As Harris County judge, Ed Emmett led the state's biggest county — 4.7 million people — through its most devastating natural disaster. That work won the moderate Republican bipartisan support, even in a county that overwhelmingly went blue in 2016. But last week, Emmett lost his re-election bid in a close race — the closest in the county. And come January, the incumbent will turn his job over to Democrat Lina Hidalgo, a 27-year-old political newcomer who had never attended a meeting of the commissioners court she will now lead (she has, she said, watched them online). At the top of the ticket, U.S. Sen. Ted Cruz lost the county by more than 200,000 votes; Emmett’s race — midway down the longest ballot in the country — was decided by a margin of about 19,000 votes. That result, strategists say, makes Emmett the latest casualty of straight-ticket voting in Texas. 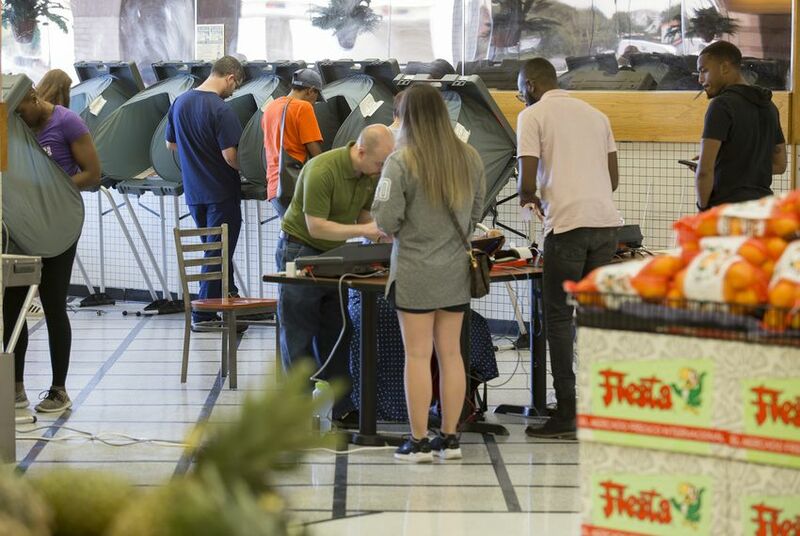 In Harris County, more than half a million voters pulled one lever to support every Democrat on the ballot, and just over 400,000 Republicans did the same. Emmett — a moderate who had focused his campaign on persuading the Democrats who favor him to make their way far enough down the ballot to back him — made up much of that difference, but he couldn’t quite eke out a win. Hancock told The Texas Tribune this week that “we waited one election cycle for implementation to allow plenty of notice for everyone, including candidates, election administrators, and voters." Many Republicans tout the end of straight-ticket voting as a way of ensuring good governance. “Eliminating straight-ticket voting has never been about benefiting one party or the other — it is promoting good government by making sure that every voter knows who they are voting for and what their qualifications are,” said Sherry Sylvester, a senior adviser to Republican Lt. Gov. Dan Patrick. When the bill passed the Texas Senate, it drew most opposition from Democrats, who questioned whether eliminating the one-punch option would disproportionately hurt voters of color. A federal judge found as much in a Michigan lawsuit. Ultimately, in this election, straight-ticket voting seems to have worked largely to Democrats’ advantage. Simmons, who was unseated from his Carrollton district on Election Day, said he believes straight-ticket voting played a role in the loss. “If we had to look at it again, there are people that might have wished we could have [ended] it in 2018,” he said. There are “probably 12 House members” who are regretting the delay, he said. Many of those House members are, like Simmons, in the Dallas area, where Republicans lost several state House seats, a Democrat picked up a Republican-held congressional seat and an appellate court that hasn’t elected a Democrat since 1992 flipped into Democratic control. Even as Democrats celebrate their victories, some quietly acknowledge that their winning candidates are not all equally prepared to take office. Especially in down-ballot judicial sweeps like those that flipped four state appeals courts last week, some strong, well-funded candidates enter office with years of experience while others are swept in on the top of the ticket’s coattails. Some appellate lawyers are warily looking ahead to courts with new ideological bents and less experienced judges. On the Austin-based 3rd Court of Appeals, for example, some candidates raised tens of thousands of dollars, while others were largely absent from the campaign trail. In Dallas, the differences were even more stark. Ken Molberg, a longtime judge in the area and a former Dallas County Democratic Party chairman, outraised his fellow Democratic candidates by orders of magnitude. But come Election Day, they won by similar margins — a sign of the little attention paid to down-ballot races. “I’m old enough to have lived through various party sweeps with the straight party voting, and generally, when you have a sweep, you still will have some good folks that get on the bench and some people that ought not to be there,” said Craig Enoch, a former Texas Supreme Court justice. Last week, voters in a 20-county district along the Gulf Coast elected to an influential state appeals court Rudy Delgado, who resigned his seat on a lower court earlier this year after he was indicted on federal bribery charges. Prosecutors claim that as a judge, he accepted bribes for favorable rulings. Delgado’s attorney said in court documents he was “no longer campaigning for office,” and he was absent from the campaign trail — though he did report spending hundreds of campaign dollars on iPads and other goodies at a local Best Buy. Delgado did not return requests for comment. Delgado may never preside over a case; the State Commission on Judicial Conduct has already suspended him from serving on a lower court, and the commission could suspend him from serving on the court of appeals even as his criminal case proceeds. His Republican opponent, Jaime Tijerina, worked to spread the word about Delgado’s criminal indictment. But even still, Delgado was a Democrat running in a heavily-Democratic South Texas judicial district; party officials and billboards on the side of the road urged voters to cast straight-ticket Democratic ballots. With that boost, Delgado eked out a victory. In the other judicial two races for 13th Court of Appeals, Democrats bested their Republican opponents by about 30,000 votes. Delgado beat Tijerina by about 3,000. The difference, Tijerina said, was made by voters who heeded calls from Democratic party officials to cast a straight-ticket ballot.